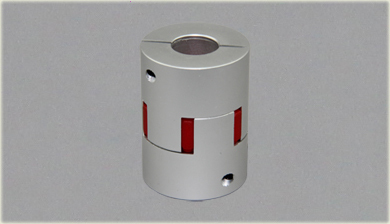 Aluminium flexible couplings are offered in the industrys largest variety of stock bore/keyway combinations. These couplings require no lubrication and provide highly reliable service for light, medium, and heavy duty electrical motor and internal combustion power transmission applications. Applications include power transmission to industrial equipment such as pumps, gear boxes, compressors, blowers, mixers, and conveyors. 1.Materail: Aluminium alloy or steel,TPU,NBR rubber etc.2.Elastic Spider: Three type of Elatic Spider can be choosed 86SH. A 92SH. A 98SH. A 3.Surface treatment: black finished / Anodizing. 4.High sensitivity High torque rigid Zero back lash. 5.Type of shaft lock: Setscrew or Clamp type. 6.Rotation character of clockwise or anti-clockwise are exactly the same. 7.Coupling assembled by pressing a polyurethane sleeve into hubs on both sides. 2. Small volume and large transmitted torque. 4. Easy pulling out and install. 5.Stock to ensure a prompt delivery within one week. 6. High-performance with competitive prices.